Happy Birthday, Clayton Moore. | 50 Westerns From The 50s. « Happy Birthday, R.G. Springsteen. The great Clayton More was born 104 years ago today. He was a terrific heavy in tons of Westerns and serials. He was a inspiration to kids everywhere as The Lone Ranger. And by all accounts, he was a really nice guy. Happy birthday to Clayton Moore, the one and only Lone Ranger. Clayton Moore lived The Lone Ranger right to the end. It was a great shame and insult that he was messed about for wearing the black mask in later life. l think he ended up in court over the matter, and eventually had to wear dark glasses instead. The Lone Ranger was a great western character, and Clayton was the best Ranger. Mike, I remember all the flap over taking away the mask from Clayton Moore. Producer Jack Wrather wanted to reboot the Lone Ranger with Klinton Spillsbury. In 1979, Moore was banned from wearing the mask at appearances because of a new Lone Ranger movie that was to come out in 1981. Wrather took out a court order against the beloved actor. It was a public relations disaster for THE LEGEND OF THE LONE RANGER which bombed at the box office. Clayton Moore received close to a million letters in support and received so much free publicity that he started making appearances in some specially designed Foster-Grant wraparound sunglasses and landed a huge endorsement contract. I remember watching the commercials. “Who is that man behind those Foster Grants?” A month before he died In 1984, Producer Jack Wrather gave Moore the right to wear the mask again and the court order was lifted and Clayton Moore the Lone Ranger could once again wear the mask. HI YO SILVER, AWAY! Thanks for the full details Walter, l do remember now, it was all about that Klinton Spillsbury Lone Ranger film, that not even Lone Ranger fans went to see. I thought the bet Lone Ranger, by far, was Brace Beemer, and he did it with his voice, though eh did have the physique and stature to have gone into the televisions series. …best, and he…Sorry about that. 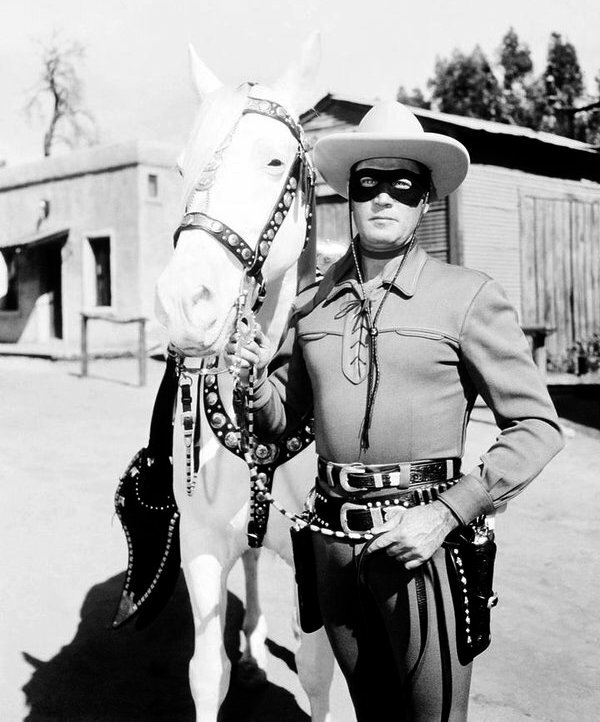 I grew up with The Lone Ranger on TV and for me Clayton Moore IS the Ranger. At the time, we never noticed (somehow) that John Hart had the role for 52 episodes. (I had the pleasure of meeting Mr. Hart when he visited Britain about 20+ years ago). Nice tribute, Toby, to a nice guy. Hi Yo Silver! Jerry, I’m curious about your meeting with John Hart during the 1990’s. Also, Hart portrayed Hawkeye in a Canadian series HAWKEYE AND THE LAST OF THE MOHICANS(1957) after he was the Lone Ranger. Walter, I believe this would have been in 1994 or 95. He was the main guest at a ‘B’ western convention held for many years in the UK Midlands area and answered many questions from the audience. Nice guy. Jerry, thanks. I’m envious that you were able to attend “B” Western conventions when the Stars were still with us. Here in the US during the 1960’s(where I was at, anyway), the syndicated re-runs of THE LONE RANGER didn’t show the 52 episodes that John Hart portrayed the Lone Ranger. drive- in restaurant on Beach Blvd. in Huntington Beach, CA. this parent had hoped for in the early days of TV super heroes who rode away in a “cloud of dust”. He was special! Maxofdimitrios, what a wonderful memory. Thank you for sharing it with us. Thanks for sharing your story. Wish I’d had a chance to go to one of his personal appearances. There’s something about The Lone Ranger and Dragnet that makes me feel like everything’s right with the world! I wasn’t a real LONE RANGER fan but what he stood for makes me feel proud and Clayton Moore played him better then no one else .Clayton Moore was THE LONE RANGER .Happy Birthday and RIP. Criterion have announced a December release for 40 GUNS on DVD and BLU RAY .Good to see they are releasing more westerns .I would love to see SHANE and GUNFIGHT AT THE OK CORRAL get the Criterion treatment. Great news and the Blu-ray release will be sourced from a new 4K scan which should be way superior than the UK and other european Blus. that was,of course when Paramount were still releasing vintage movies. is getting the Criterion treatment-it sure needs it. finest Western (IMHO) RUN OF THE ARROW appears on Blu Ray. Last Train From Gun Hill sits in the top slot of my Blu-Ray want list. I agree, the existing Blu-Ray of OK Corrall is very nice indeed. John K,I guess the reason I would like SHANE and GUNFIGHT AT THE OK CORRAL get the Criterion treatment is because of the extras they include ,but I’ve no doubt that the Paramount and Eureka copies are excellent in terms of picture quality.When I joined the BLU RAY club,I said I would not double dip,but with these two films being in my top 10,I could be tempted .I have the Criterion version of THE FURIES with Barbara Stanwyck . Incidently ,I must watch my Criterion version of IT’S A MAD MAD, MAD,MAD WORLD which comes in dual format .Anyone who hasn’t seen this film is missing out on a very funny movie. John K,I just tried to buy a Eureka copy of SHANE ,but only the one disc version is available as the 2 disc version was limited to 2000 copies.You can still buy the 2 disc version very expensive ,but I’ve only seen new copies on Amazon Uk and unfortunately they don’t ship to Australia .I do hope that Criterion release THE NAKED SPUR.Although I have it on DVD ,it was a hard film to locate. I agree with John, don’t wait for a high priced Gunfight at the OK Corral, buy the bargain UK or USA Paramount Blu ray, it’s great, though lacking extras.